Thank you for your interest in becoming an affiliate for Homeschool Preschool. The resources featured on Homeschool Preschool are geared toward children ages 3-7. Affiliates earn 30% of customer sales that come from the affiliate's referral link. Affiliates will be paid at the first of the each month based on the previous month's earnings. That means your September commissions will be paid in October. All payments will be paid through PayPal and any related fees will be paid by you (the affiliate) not me. Affiliate links contain unique identifiers allowing us to assign cookies to anyone that is coming to the site through your links. Cookies remain active for 90 days. 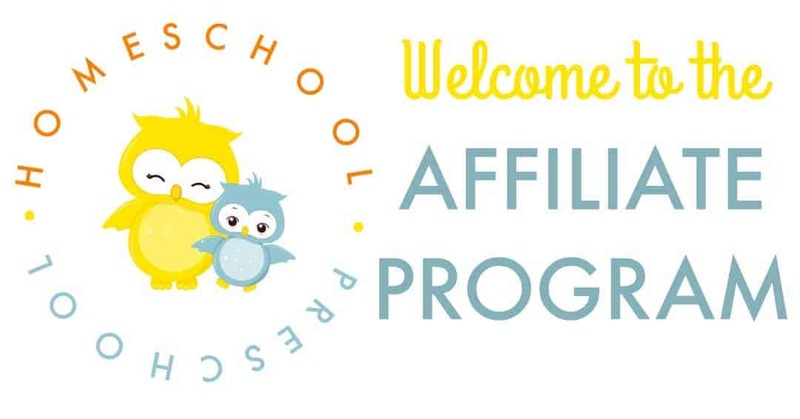 This means that if someone visits Homeschool Preschool through your affiliate link, you will earn 30% of what they purchase within that 90-day period. If you have questions, please email me at tara@homeschoolpreschool.net. • Write a blog post sharing your thoughts about our printables. • Use the products with your own children and share your experience. • Link to our most popular products in your blog posts, on social media, and/or in your newsletters. Ready to join the Homeschool Preschool affiliate program? Click the button below to sign up through SendOwl (you will be required to create an account). I will review the application and get you set up as soon as possible.